Welcome to the Three Horseshoes Inn. We are a cosy gastropub tucked away in a cul-de-sac on a small hill in the quaint village of Groesffordd. In early 2017 the pub was extensively refurbished and extended to create a 46 seater restaurant, traditional bar, open fire, real ales and high-quality gastropub style food. Ashley Haworth has owned and run the country pub and restaurant for over twenty years now, keeping it updated, the menu interesting, but still retaining the cosy, historical vibe of its past. The Groesffordd (as the Three Horseshoes Groesffordd is more affectionately known to the locals) started out as a house called Ty R Yr Groesffordd which loosely translated means…”House on the crossways”. At the time it was situated next to the railway line and Groesffordd Halt.  In 1846 a man named David Powell who was a local blacksmith decided that he would open a Blacksmith Shop and Inn in the house and named it The Three Horseshoes. The name was derived from the belief that when a horse lost its shoe, the horse’s owner would stop at the inn to re-shoe his horse and thus when they came, the horse only had three shoes. The pub itself has had many landlords over the years but was kept in one family for over one hundred years. Here at the Three Horseshoes Inn we pride ourselves in providing only the finest quality food. Every effort is made to locally source our ingredients. Our meat is from F E Richards of Crickhowell who supply us with 28-day dry aged beef, Welsh lamb and local free-range pork and poultry. Our fish comes from Moby Nicks in Plymouth who source their fish from Devon and Cornwall and we use local organic farm Primrose Organics for seasonal and organic vegetables, herbs and flowers. Our chefs regularly forage in the beautiful local area with Adele Nozedar – a highly-esteemed author, food writer and passionate forager for fresh, seasonal ingredients. We only work with trusted suppliers and this is reflected in the quality and taste of all our dishes. Whether you are popping in to see us for a pint during a hike through the Brecon Beacons, something hot during the colder months, or a bottle of wine to accompany your dinner we have it covered. We have a wide range of beers and ciders, from local brewed offerings to the classics. Our wine can be ordered by the bottle or glass and we have a good choice of spirits and soft drinks including a non-alcoholic gin! We believe that when you go out for dinner you want something more than you can just make yourself at home. That is why our chef works hard to create an inventive and delicious menu that will have you wowed from the very first taste. Our food is modern British style and our menu changes every month to incorporate the freshest and most in-season ingredients. You can choose from dishes such as pan-roasted Dover Sole or Leek and potato confit, or some of the more traditional pub classics such as the Three Horseshoes Pie or classic Fish and Chips.